I’m with Ace and Allahpundit on this. 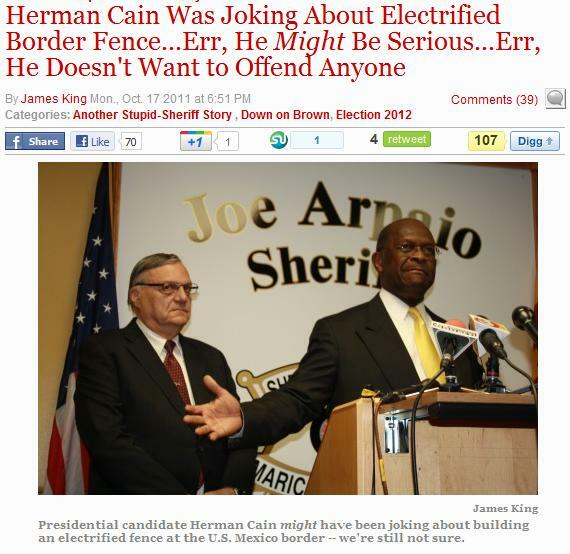 Herman Cain says he was just joking about the electric border fence… Except that he wasn’t kidding. Presidential candidate Herman Cain met with Maricopa County Sheriff Joe Arpaio this afternoon, but he was late to the meeting because of an unknown security threat. Once Cain arrived, however, it didn’t take long before he was asked about a controversial “joke” he recently made about installing a 20-foot-tall electrified fence along the U.S./Mexico border to keep immigrants from entering the country illegally. Only, it might not be a joke, he later said, before finally saying he just doesn’t want to offend anyone.